Fire curtains and Smoke curtains are active Fire Barrier assemblies which comprise of technologically advanced fire resistant fabric encased in a compact steel housing. Fire curtains and smoke curtains remain invisibly retracted until activated by an alarm or detector signal, at which time the fire barrier assemblies descend safely to their fire operational position. VSE is a fire and smoke curtain supplier and installer. 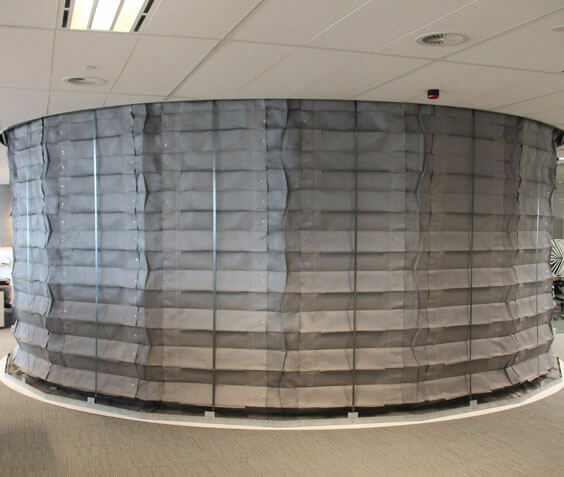 To be compliant, this type of fire barrier using fire curtain or smoke curtain, must be protected from a short circuit or total power failure, which is achieved with the help of a total gravity fail safe system. Fire curtains and Smoke curtains stop the spread of fire and smoke in a building when retracted and offers large free open spaces in normal conditions. This fire barrier allows evacuation of occupants or rescue personnel with emergency retract buttons. The unique overlapping design can provide unlimited widths for large areas.